Why you should go: If you know your music and lyrics from Maroon 5 to "Mambo No. 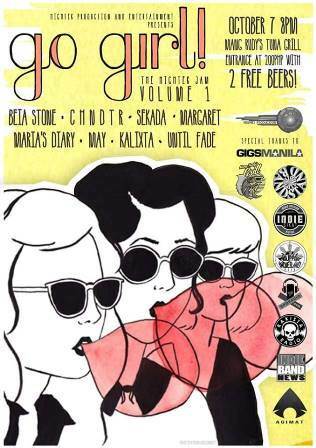 5," then head on over Commune at Poblacion, Makati on Wednesday! 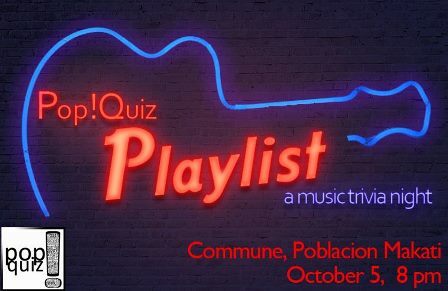 Test your knowledge from novelty songs, OPM icons, boybands, rock bands, VMA winners, and more. Expect a lot of music, singing, and competition. Other details: Event starts 8 p.m. Participation fee is P400 per member which includes a welcome drink and an appetizer for your table! Teams can be made up of two to six players. Why you should go: Pump up the volume and put on your trap and hard style playlist! The one and only Slander will be performing at Chaos Manila for this week’s edition #NXTLVL Thursday. 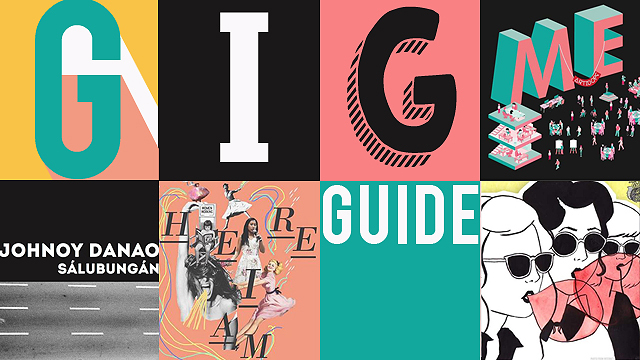 Why you should go: It’s girl power night and what better way to celebrate it than a gathering of indie girl performers and groups? Watch live performances from Beia Stone, chndtr, Kalixta, Margaret, Maria’s Diary, May, Sekada, Until Fade. Other details: Gig starts 8 p.m. Gate charge P200, inclusive of two bottles of beer! Why you should go: Join singer-songwriter Johnoy Danao as he launches his upcoming album, Sálubungán at The 70's Bistro this Saturday. There will also be performances by Coeli, Ben&Ben and of course, Johnoy Danao himself. Other details: Launch starts 8 p.m. For inquiries and reservations, call 433-8070. 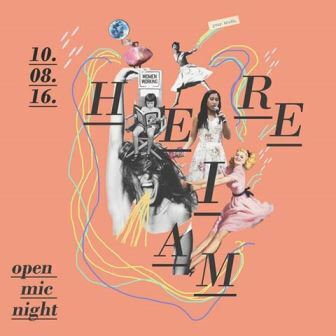 Why you should go: Woman, Create presents Here I Am, an open mic night celebrating truth and women empowerment. 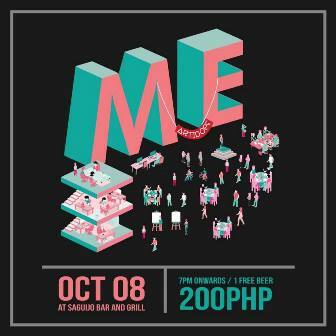 There will be music from Ja Quintana, LUXECALIP, Roy Antonio, Vica Hernandez, and Toni B, as well as spoken word performances from Maine Manalansan, Fiona Rama Comendador + Chase Castro, Isa Garcia of The Better Story Project, Danah and Stacey Gutierrez of PLUMP, and Michelle Manese of Words Anonymous. Other details: Doors open at 4 p.m. Door price is at P400. Why you should go: Music, art, and spoken word poetry meets in this anniversary celebration, featuring The Artidope, Esremborak, Gian Bernal, Lapis Artcom, Life//Lost, Loudmouth Collective, Mga Apo, Rod Marmol/Utot Catalog, Walking Rainbows, and White Wall Poetry. Other details: Event starts 8 p.m. Get in for P200, inclusive of a free drink. 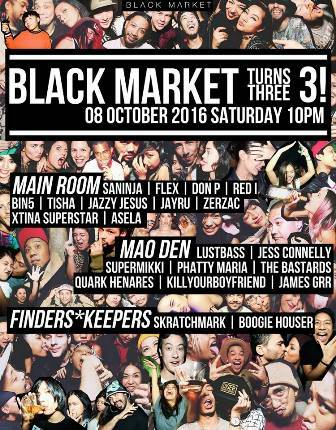 Why you should go: Celebrate Black Market’s third anniversary with Saninja, Flex, Bin5, Tisha, and more performers in the Main Room. There’s also LustBass, Jess Connelly, Phatty Maria, The Bastards, James Grr, and Quark Henares who will be in charge of the Mao Den. Other details: Party starts 10 p.m. For inquiries and reservations, contact 0917-829-4162. 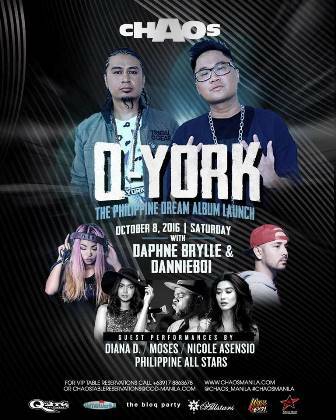 Why you should go: This Saturday, witness performances from Diana D, Moses, Dannieboi, Nicole Asensio, The Philippine All Stars and Q-YORK as they launch their new album The Philippine Dream along with Chaos residents Alex Wong and X-Factor. Why you should go: Monday doesn’t have to be so gloomy when you’ve got music to set the mood for a fantastic week ahead. Catch Rockoustic, Hilera and Brisom at Moondawgs Live at 70's Bistro on October 10! Other details: Gig starts 9 p.m. Get in for P200, inclusive of a free beer. 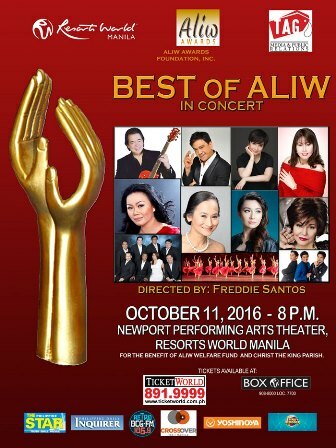 Why you should go: The Best of Aliw brings together powerhouse performers Lea Salonga, Rico J. Puno, Dulce, Jed Madela, Lisa Macuja Elizalde, Gerphil Flores, RJ Jacinto, Imelda Papin, students from the Halili-Cruz School of Ballet, The Angelos, and Spirit of ’67. 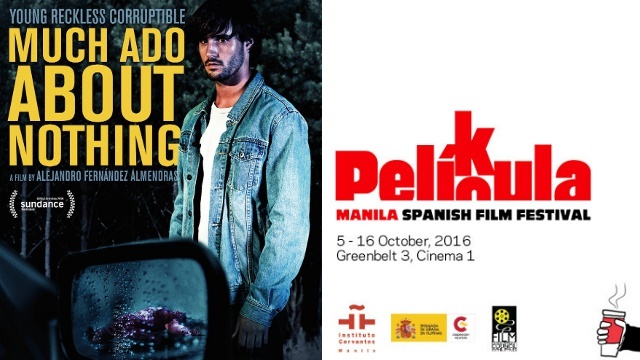 Proceeds of the show will also go to the Aliw Welfare Fund and Christ the King Parish. Other details: Show starts 8 p.m. Tickets range from P1,321 to P5,505, available at TicketWorld outlets.